Hackulous, the community dedicated to the cracking of Apple DRM and the indexing of unprotected software for iPhone, iPod and iPad, has announced some interesting innovations. As well as having cracking software for the yet-to-be-released Mac App Store already up their sleeve, they also have an intriguing "reverse BitTorrent" system for jailbroken devices which will increase cracked app availability on the Internet. For the last two years, the Hackulous community has been working to circumvent the DRM on Apple’s iPhone, iPod Touch and iPad products. Their agenda is fairly straightforward. They do what they do because they believe that Apple’s App Store is unfair to consumers since it has no trial service or refund policy. 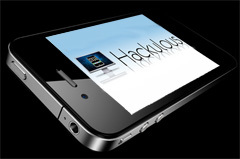 Hackulous are most well known for two products. The first is Apptrakr, a web-based index of cracked apps which has between 10 and 11 million unique users per month. The second, Installous, is a piece of software resident on 8 to 9 million jailbroken Apple devices which allows the installation of software found via Apptrakr and elsewhere. Hackulous admin Dissident has just announced a number of new developments and innovations. The first related pair are upgrades to ‘Clutch’, a piece of software which allows the cracking of iOS software, and its GUI called Crackulous. The second is ‘Overdrive’, a piece of code which stops applications becoming self aware. Apptrakr is also receiving various upgrades but an update included in the new Installous 4 package is of particular interest. While Apptrakr has an absolutely huge database of cracked apps, by no means does it index all apps currently available. However, as millions of Installous users are also buyers of apps from the App Store, most titles will already be installed on their collective devices. But how can they be shared with the world? Described by Dissident as a kind of ‘reverse BitTorrent’, Mobile Hunt is a clever way of utilizing an existing network of millions of peers to provide a solution to the app supply bottleneck. “Essentially what will happen is when you’re using Installous you’ll get a little pop up that says ‘Hey, you have an application that Apptrakr doesn’t. We will add the application to a queue in the background (if you say yes) and it will start uploading tiny pieces of it, kind of like a torrent, up to the cloud’,” Dissident explains. So, unlike BitTorrent, where one starts with a single file that multiplies the more people jump on the torrent, with Mobile Hunt the start point is perhaps hundreds or thousands of copies of the same piece of software, and little tiny pieces of each upload from each person’s device to the cloud in order to make one final copy, which will then become available from Apptrakr. From there it will be available for millions to download. The other announcement from Hackulous is also very significant. On January 6th, Apple will release the Mac App Store and before it’s even released, Hackulous have cracked its security. By removing DRM from products available from the Mac App Store with a new product called ‘Kickback’, Hackulous will be able to offer the same kind of free download service for Mac as they do for iPhone, iPod Touch and iPad. But that doesn’t necessarily mean that they will do so immediately. “We don’t want to release kickback as soon as the [Mac App] Store gets released. I have a few reasons for that,” Dissident explains. As mentioned earlier, Hackulous and its suite of services exists to provide a try-before-you-buy trial service and this was only needed when Apple allowed “tons of crap” software on the App Store. “Most of the applications that go on the Mac App Store [in the first instance] will be decent, they’ll be pretty good. Apple isn’t going to put crap on the App Store as soon as it gets released. It’ll probably take months for the App Store to actually have a bunch of crappy applications and when we feel that it has a lot of crap in it, we’ll probably release Kickback,” says Dissident. So how long will it take for the Mac App Store to become polluted enough for Kickback to be released? Maybe February…..
Apple Users Forced to Pirate VLC Player? Whatever Next?